Eco Insulation offers various Missoula insulation services, all of which are aimed at maximizing your home’s energy-saving potential. The right kind of insulation will provide both long-term energy savings as well as enhanced personal health and comfort. When insulation materials are poor in quality or improperly installed, energy costs go up far higher than you might realize. The same is true for faulty or damaged ventilation systems or air ducts. Most people have no way of measuring just how much they’re losing out on due to sub par home insulation. However, as a BPI Certified company, Eco Insulation can measure that for you first hand via a full Energy Audit. This will tell us exactly what needs to be done in order to bring your home up to its full energy saving potential. Not only that, but after our services are complete, we can conduct a follow up audit to show you just how much you’re saving as a result. Air Sealing: This involves caulking and weather-stripping your home, making sure all relevant areas are properly sealed. Attic Ventilation: We will install baffles in your attic, preventing insulation from blocking air flow. This also prevents the accumulation of moisture that can lead to mold and rot. Duct Sealing: Faulty duct systems are one of the leading causes of air loss. According to the EPA, about 20 to 30 percent of air is lost through the duct system. Both warm and cold air circulating this system ends up escaping through various cracks, holes, and leaks. The end result is a home that’s less cool during the summer and less warm during the winter, thus increasing your energy bills. A loss of air pressure also ends up diminishing your overall personal comfort level. This part of our Missoula insulation services includes going through and sealing off any areas in your duct systems where air can escape, such as supply lines, folded edges, joints, returns, and registers. Fiberglass Insulation: When it comes to insulation, most people think it is merely about retaining warmth during the winter. While this is certainly a major factor, the right kind of insulation can also keep your home cool during the summer. 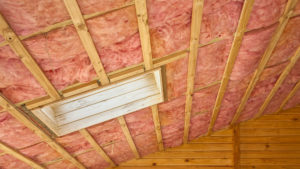 Fiberglass insulation will enhance the energy saving potential of your home year-round. It will also reduce greenhouse emissions, and prevent the accumulation of condensation on the walls and ceiling. The level of personal comfort that comes with fiberglass insulation is also a nice touch! The Missoula insulation services of Eco Insulation come with Guaranteed Customer Satisfaction, as well as a Lifetime Guarantee Against Insulation Settling. If for any reason you don’t find our work 100% satisfactory, we will do what it takes to correct it at no extra cost. When you choose Eco Insulation, you can rest assured that you are getting the highest quality insulation products and services. We will help you maximize the energy saving potential of your home. That means more money in your bank account, and a higher level of personal health and comfort in the long-term.